This surprisingly soft pillow boasts all the benefits of bamboo—like that it’s antibacterial and hypoallergenic—and is then further enhanced with a supple, silk filling. Yes, silk. These materials wick away moisture to regulate body temperature, so both hot and cold sleepers stay comfortable. And, unlike down or cotton pillows, silk stays evenly plump. Dimensions: Standard: 20" x 30"; King: 20" x 36"
All-natural and sustainable, too, these bamboo sheets feel like silky, matte satin. They’re amazingly soft and smooth. And when we learned about the wonderful benefits of bamboo—it’s temperature regulating, hypoallergenic, antibacterial, anti-fungal, and anti-mold—we knew it was a find we had to share. Bamboo fiber wicks away moisture, so it keeps both hot and cold sleepers comfortable. 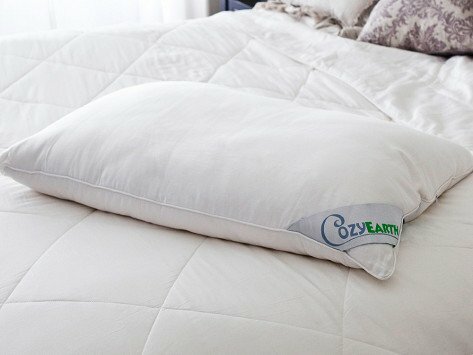 It naturally resists dust mites and bed bugs, too. Cozy Earth doesn’t detract from the natural properties of their fibers—keeping out chemicals, dyes, and anything synthetic. It’s all certified organic. Founder Tyler Howells saw a need for natural bedding when his pregnant wife suffered from hot flashes and couldn’t get comfy in bed. He realized that anyone could benefit from the advantages of bamboo bedding, and we couldn’t agree more.